Lorna's Laces is a hand-dyed yarn company that is based in Chicago. Their many solids and multis play well together in all sorts of different projects. Shepherd Sport is a 100% Superwash Merino Wool, great for easy care projects, and soft enough for little ones. A three ply yarn, it has great stitch definition and shows off cables well. A great yarn for mosaic knitting as well, the multis and solids can be paired together to make daring or subdued combinations. Shepherd Sport is also a great yarn for thicker socks, especially cozy during cold winter months. Explore the many unique colors that the Lorna's Laces line has to offer! 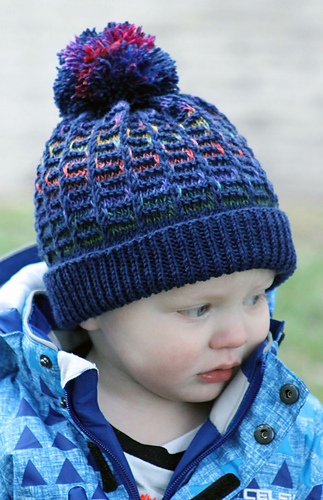 Gretchen Tracy's Rainbow Mosaic Hat is a great project for this yarn, link available here: Rainbow Mosaic Hat. Image © 2016 Gretchen Tracy. Knitting Gauge: 5.75-6.5 sts = 1"
Crochet Gauge: 16 - 20 sc = 4"